Jacob had a good day today. 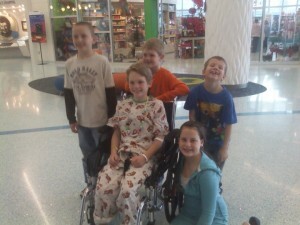 He got to play with his cousins for a while and even got out of his wheelchair and pushed it around for a few minutes. 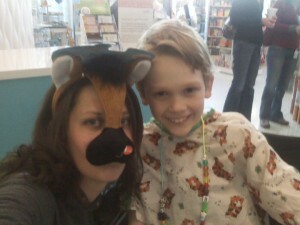 He enjoys scaring his mom by doing things himself instead of waiting for help. He had a bladder exam at 3:30 this afternoon, and tomorrow morning is his PET scan (to check the spot discovered on his brain during a previous scan). His bone marrow tests came back clear! Praise God! If his PET scan results come back negative, that will mean the cancer has not spread and is confined to just that small spot on his spine. 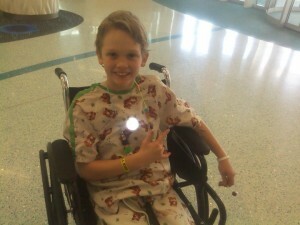 Please continue to pray for Jacob! Tomorrow night, Ken will be making the long trip back down to Grand Rapids from Marquette to be with Jacob, Caleb and Erin through the weekend, which everyone is very excited about. The family also got a chance to learn about all of the wonderful and incredibly generous donations from their family, friends and even complete strangers today. They were speechless! It will be such a blessing for them! Glad to hear everything is going good for you Jacob. You look great:) We are all praying for you. So glad to hear everything is going good for you! You are such a strong boy! Thinking of you everyday. It is so nice to see the smile on your face Jacob! Keep smiling! I am so happy to hear that you are doing so well! Love the pictures! How great to have your cousins with you. My cousins mean a lot to me too. We are all thinking of you and send wishes for a quick recovery! Hey Jacob, We here at Crossroads U.B. Church in Charlotte are all praying for you. Be strong and God will see you make it. Take care. I like your pictures and I`m glad your feeling better! Hi Jacob, it is so good to see you smile! I’m glad you are able to share pictures and updates with us! I don’t know you very well, but I worked with your Mom at school and have heard lots about you! Praying for a speedy recovery!